On December 6, 1955, Russian immigrant Dr. Igor Bensen made the world’s first gyrocopter flight in Kitty Hawk. After working for General Electric, Bensen created his own company, Bensen Aircraft Corporation, to mass produce personal flying machines near Raleigh-Durham Airport. The Bensen Gyro-Copter was designed to be built by the purchaser in a garage with ordinary hand tools. It was relatively inexpensive, with kits priced at less than $2,000. The finished product could be converted from a gyrocopter to an automobile by locking the rotary blades in place. 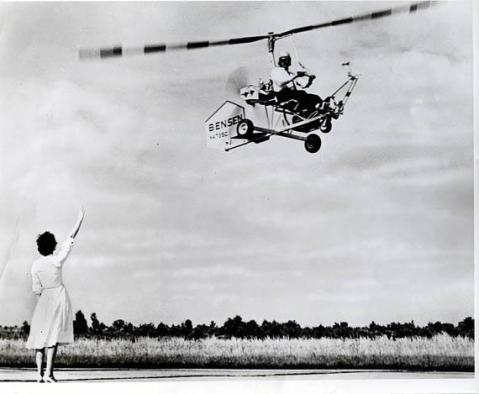 The most famous of Bensen’s gyrocopters was the Spirit of Kitty Hawk, in which he duplicated the first flight of the Wright Brothers on its 60th anniversary in 1963. During the next few years the craft set more national and world records that any other civilian rotary aircraft in the world. Law enforcement agencies and crop dusters continue to use gyrocopters in their work. A highly modified Bensen gyrocopter appeared in 1967’s Bond film, You Only Live Twice, complete with non-standard smoke screens and rocket launchers. The Bensen Aircraft Corporation closed in 1989. Visit: A Bensen gyrocopter is on display at the North Carolina Museum of History in Raleigh and the N.C. Transportation Museum in Spencer covers a wide range of aviation-related topics.